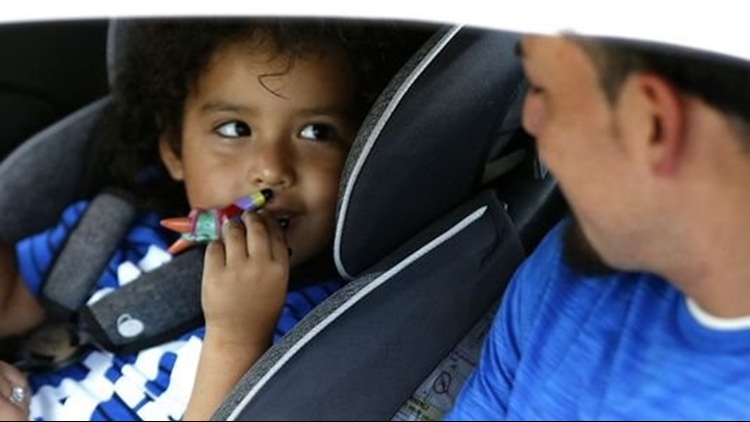 The three-year-old son (no name was given) of Ever Reyes Mejia, of Honduras, looks at his dad with a smile while being buckled into a car seat after his reunification with his dad after being separated for three months. There were eight children in Michigan under 5-years-old in foster care. GRAND RAPIDS, Mich. - Three families have been reunited in Grand Rapids after being separated at the border three months ago. Ever Reyes Mejia walked out of the back door of the ICE office with tear filled eyes as he held his 3-year-old son. Abril Valdes, ACLU immigration attorney, is representing two of the three fathers. Both of them came from Honduras with their 3-year-old sons sometime around April seeking asylum. "Everyone was crying," Valdes said after meeting with her client and his son just before they were taken into temporary housing. Reyes Meija had not yet been able to speak to his son since they were separated. He was previously put on the phone with a child who was not actually his son. Reyes Meija told Valdes on Monday that he is distraught and feels as though this is his fault. Their entire family came to the U.S. border in Texas from Honduras seeking asylum due to MS-13 gang violence. His wife and 5-month old daughter have been released in Texas. 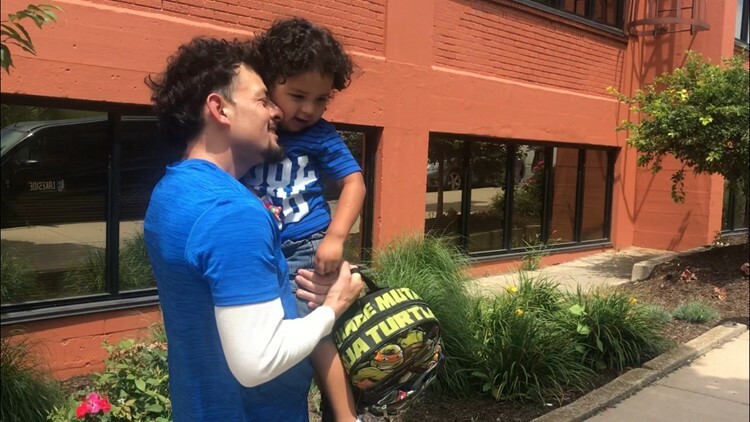 On Tuesday, July 10, he was reunited with his son and likely will be kept track of by Immigration and Customs Enforcement using a tether. He is supposed to have an immigration court hearing on July 12 in Detroit. Valdes was not able to physically see her client at the ICE office until he and his son were released from. ICE officials said their office was not a facility where attorneys and clients could meet privately. She was able to communicate with her client by phone in the meantime. Valdes met both clients for the first time Monday at Calhoun County Jail where they were housed due to the fact that their sons were both being fostered in Michigan through Bethany Christian Services. She said Reyes Meija told her he was filling out paperwork in a Texas detention center while his son was sleeping. That was the last time he saw him. His wife was in brief contact with the 3-year-old in the weeks prior and said he barely spoke, traumatized by what’s happened. The families were released into the community per a court order. There were a total of eight children in Michigan under 5 years old in foster care. Bethany Christian issued a statement saying all seven in their care have now either been reunited with their families or have plans to be reunited. Valdes said one child's parents have already been deported leaving him orphaned in Michigan. Valdes could not later be reached for further clarification on this child's specific situation. Valdes appeared emotional following the family's release, she said the children were confused but still thanked and hugged her. Valdes' second client asked that she not share his story for his family's privacy, but he was also reunited with his 3-year-old son and taken into temporary housing. "We are deeply relieved that our client has finally been reunified with his four-year-old daughter after having been separated for more than three months. Our law firm Paul, Weiss remains committed to helping families who have been harmed by the separation policy and ensuring that these families be accorded the due process to which they are constitutionally entitled." The U.S. government is under a deadline to reunite all children under the age of 5 with their parents by the end of the day on Tuesday, July 10. A government lawyer said that at least 54 of these children would join their parents by the court-ordered deadline. That is only about half of the 100 or so children who are covered by that order. The administration is also bracing for another deadline on July 27 to reunite nearly 3,000 older children —up to age 17—with their parents. After reunification, it's expected the families will be released from custody while their immigration case moves through the system.